The authors looked at clinical trials and cohort studies of extensor tendon rehabilitation protocols published in English between 1960 and 2016. They examined, among other things, the outcome measures of Total Active Motion (TAM), grip strength and the return to work rate. Overall, the authors noted that the 11 studies included were of average quality with differences in reporting, outcome measures, loss of patients to follow-up and lack of randomization or blinding. However, they were able to make some recommendations from their investigation. But first, a review. Immobilization is usually done with clients wearing a cast or static orthosis which restricts motion at the wrist, MCP joints (and often IP joints), for a period of 3 weeks. This protocol protects the tendon from any tension whatsoever, but may cause tendon adhesions. 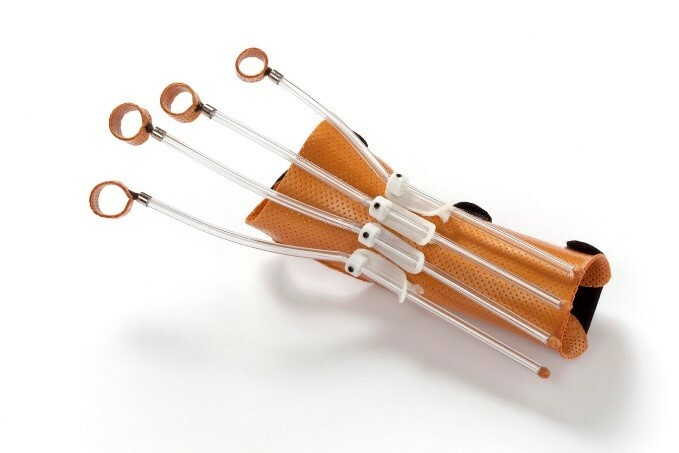 Early passive motion involves controlled motion of the repaired tendon via specific exercises or more commonly via a dynamic extensor tendon orthosis. The authors note that this method is not entirely a passive method. 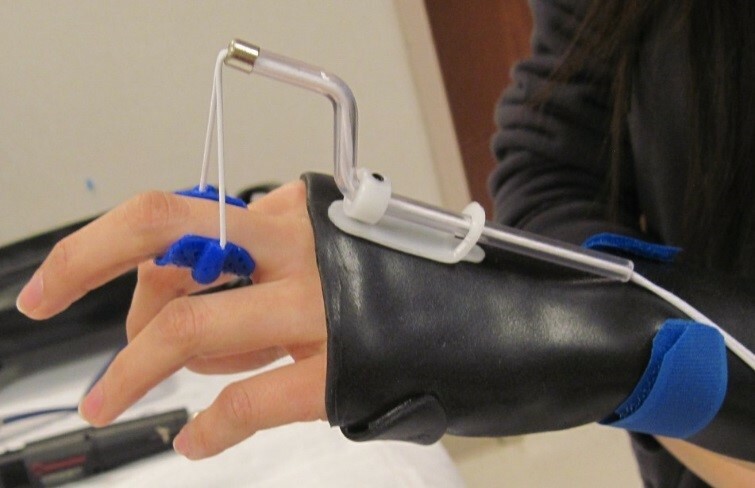 Early active motion protocols allow the client to actively flex and extend the fingers and wrist while controlling tendon excursion, often using the yoke orthosis (relative motion orthosis). The authors noted that while the specific orthosis is meant to be a “tool” in the rehabilitation process, the orthosis itself can affect the outcome regarding adherence to the protocol and movement patterns. They wanted to examine more specifically how the choice of the orthosis might influence the outcomes achieved. Early active motion protocols appear superior to immobilization in outcomes of TAM, grip strength and return to work rates. Yet, it is unclear how to determine which clients are most suitable for this protocol. Several studies advocate using immobilization for clients who might be poor at adhering to the protocol, which is difficult to determine in advance. Early passive and early active motion protocols with dynamic orthoses might be better at protecting the repair site and decreasing the risk of adhesions, yet the orthosis interferes greatly with activities of daily living (ADL’s). Clinicians do not generally spend a lot of time teaching clients one handed ADL’s while wearing their orthosis. 1. 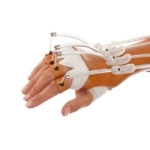 Cost of static orthosis versus outriggers and parts of a dynamic orthosis. 2. Cost of therapy visits. The authors note that clients with dynamic orthoses might require more post-operative visits immediately after the initiation of therapy, but clients following an immobilization protocol typically required more visits after the orthosis or cast was discharged. The clinician must weigh all of these factors when designing the specific rehabilitation protocol and select an appropriate orthosis for the client. The relative motion orthosis seems to be a great choice of orthosis with its low profile design and low cost. This Early Active Motion protocol, called the ICAM (Immediate controlled active motion), allows early active MCP motion and return to activities relatively quickly, often within 3 weeks. No studies of client adherence to this protocol have been performed yet. In summary, the authors recommend early active motion protocols for post-operative extensor tendon management: these protocols appear to allow clients to gain motion earlier. Additional studies are needed to look at patient reported outcomes, adherence to protocol and orthotic design. 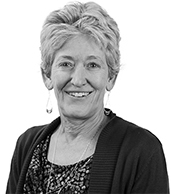 Clients may need advice on management of ADL’s while wearing an orthosis. View our instructional fabrication videos on youtube. When your patient feels that their custom-made orthosis is not comfortable, they simply will not wear it despite its necessity for optimum recovery. Use these ten tips to make an orthosis that is supportive and comfortable so that your patient will stick to the wearing schedule as outlined and optimise their recovery.